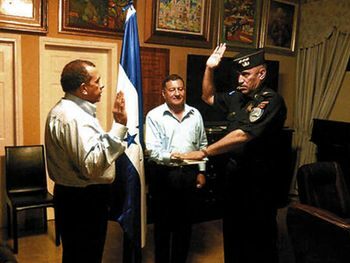 Honduran National Police Chief Juan Carlos Bonilla being sworn into office in May. Over the weekend, the Associated Press reported that the U.S. government had decided to withhold some aid to Honduras’s National Police. The partial freeze owed to concerns about the force’s chief, Juan Carlos Bonilla, who stands accused of involvement in death-squad activity during the 1990s. The U.S. government is withholding funds to Honduran law enforcement units directly supervised by their new national police chief until the U.S. can investigate allegations that he ran a death squad a decade ago, according to a State Department report released this week. That report is here [PDF]. The State Department produced it in order to comply with a requirement in the 2012 foreign aid budget law. Section 7045(d) of that law freezes 20 percent of aid to Honduras’s military and police until the State Department certifies that its human rights record is improving (more specifically, that it is supporting freedom of expression and prosecuting abuses in civilian courts). The state is obsessed with a lot of traffickers and abusers, expecting to put an end to this is been falling on the deaf ears! Nobody can let go the offenders who have been disturbing every minute thing in life, spoiling the peace of the nation. There are many online traffickers, looting money, including the famous Fintech Ltd that has been claiming to help you grow money. We need a law to protect the interests of people over such online scams, which has become rampant. Last week’s report is this certification, which frees up the 20 percent of aid that had been “on hold” all year. Its text makes clear that no aid to the Honduran National Police is in fact being frozen. It is being redirected. The Department is aware of allegations of human rights violations related to Police Chief Juan Carlos Bonilla’s service a decade ago, and has established a working group to examine thoroughly the allegations against him to ensure compliance with the Leahy Law. While this review is ongoing, we are carefully limiting assistance to special Honduran law enforcement units, staffed by Leahy-vetted Honduran personnel who receive training, guidance, and advice directly from U.S. law enforcement, and are not under Bonilla’s direct supervision.